Fish oil capsules are a convenient way to get the omega-3 fatty acids. In comparison with pure fish oil, capsules offer a measured dose in an easy-to-swallow form. To combat unpleasant side effects of fish oil capsules, such as bad breath and upset stomach, some people like to freeze the capsules before they take them. If you place fish oil capsules in the freezer, the oil inside the capsule will become solid or firm. Depending on the composition of the oil, it may remain clear or become cloudy with freezing. Some people believe that freezing fish oil is a way to test its purity--supposedly, the purest fish oil will not completely freeze. 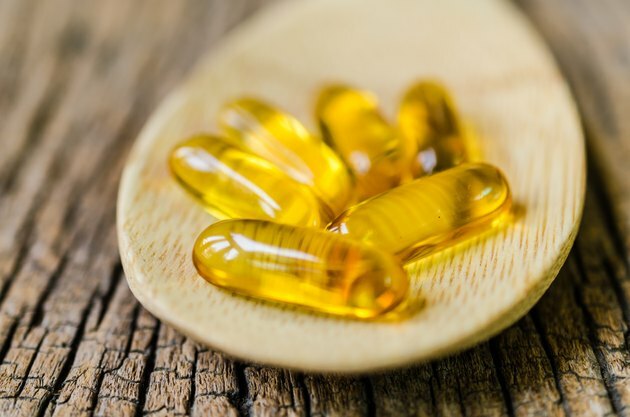 According to Craig Weatherby, writing in health-food newsletter, "Vital Choice," the idea of freezing fish oil as a purity test has been debunked as an urban myth. Several common side effects are associated with the use of fish oil supplements, according to the Mayo Clinic. Stomach upsets and diarrhea are common, with the likely severity of diarrhea increasing with higher doses of fish oil. Increased burping, along with a fishy aftertaste, sometimes develops. Freezing fish oil capsules could reduce some of these unpleasant side effects because the oil is not liquid when it enters the body. Gastrointestinal side effects, such as diarrhea or nausea, also may ease. Large doses of fish oil may lead to increased bleeding. High doses may also cause blood in the urine, or nosebleed. The Mayo Clinic website notes that some individuals are allergic to fish or fish oils, and may suffer a rash as a result of taking fish oil supplements. MedlinePlus says that freezing fish oil capsules can reduce the incidence of rash and nosebleeds as side effects. Can Fish Oil Cause Abdominal Gas?